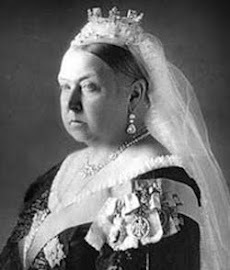 Today I begin a new occasional series of posts describing the lives of extraordinary Victorians. The first entry is supplied by Richard Wilcocks, past chairman of the Brontë Society and a bass in the Leeds Festival Chorus, a Victorian musical institution founded in 1858. A version of this essay appeared in the program for a performance earlier this month of Handel’s Messiah by the Leeds Festival Chorus. Richard is currently researching the beginning of the chorus, the opening of Leeds Town Hall by Queen Victoria (also in 1858), and the visits to Leeds of the abolitionist Frederick Douglass. If you would like to contribute a short essay to this series, please get in touch. 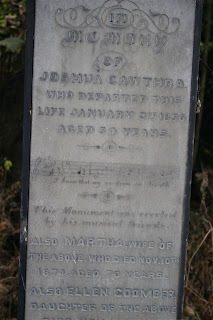 About a dozen years after the Burmantofts Cemetery in Leeds opened its gates for the first time in 1845, a fine monument was erected within its high walls to a Joshua Cawthra, who died on 3 January 1856 at the age of 54. The opening bars of "I know that my redeemer liveth," from Handel’s Messiah, were inscribed upon it, followed by "This monument was erected by his musical friends." I first stumbled upon the monument several years ago on a visit to what is more often known as Beckett Street Cemetery, opposite the Thackray Museum. Now closed, it is a fascinating, overgrown place, with about 180,000 people buried in 28,000 graves, which gives an insight into the rigid class structure and religious divisions of the times. After pushing through brambles, I rediscovered it near Anglican Walk last September. A rusty spike on the top indicated where some stone ornament had once been placed, and an empty can of glue at its base was the only tribute. I planned to find out about the man resting below with his wife Martha and three of their children. There was not much which was relevant on the Internet, so I sent out e-mails, made phone calls, and looked at eye-straining microfilm versions of the three local newspapers of the time at the Central Library: the Leeds Intelligencer, Mercury, and Times. Soon, information and help was flowing in from descendants, librarians, and local historians. Born in 1802 in the village of Hightown, near Liversedge, Joshua Cawthra was listed in a directory for 1835 as a "singing master" living at 11 Little Queen Street in the middle of a grimy, unhygienic, and rapidly expanding Leeds. He was still there for the 1851 census, with seven of his nine children: one had died and another had married. He was a "professor of music," which puts him more or less in the category of "tradesman," well below the gentry and a few rungs up from a labourer. The average age of death for a Leeds tradesman in 1842 was 27, for a labourer 19. Cholera had rampaged through the city in the warm summer of 1849, many of its victims piled into unmarked graves in the Burmantofts Cemetery. Joshua and his family were lucky. He must have had a beautiful voice: he was at one time the precentor of the Albion Chapel in Albion Street, marked "Independent" on the old maps. He seems to have moved on to embrace the establishment soon after the reconstruction and refurbishment of Leeds Parish Church in 1841 by the Vicar of Leeds, the energetic Dr Walter Farquhar Hook, a High Churchman and a Tractarian. Joshua was the First Tenor for many years in the Parish Church choir. He knew the composer Samuel Sebastian Wesley, installed by Hook as organist and choirmaster at the Parish Church, and he must have been a frequent visitor to the Music Hall in Albion Street, the largest saloon in Leeds before the Town Hall was built. At the time of his death, he had moved a hundred yards or so to 32 Somers Street. During an unspecified illness that lasted for a year, he was visited by many friends, who later organised a subscription for his monument. On Sunday, 6 January, one hundred of these, along with choristers from the Parish Church, met outside his house to sing "Is there not an appointed time," a funeral anthem by William Knapp. On the journey to the cemetery, the mourners probably looked up at the Town Hall, which was then under construction. Large numbers of carriages with harnessed horses were waiting in Beckett Street as two to three thousand people gathered on the cobbled paths and amongst the tombs in the consecrated section. Bell-like women in wide, flounced crinolines, men in frock coats and stove pipe hats, most of them with mantles and shawls to ward off the cold, watched as the cortege entered through the gate reserved for Anglicans. No doubt amongst them were his wife and children, including Thomas, the youngest at nine. Some packed into the small chapel to hear Purcell’s anthem "Thou knowest, Lord." Over the grave was sung Luther’s hymn "Great God, what do I see and hear." This, according to the Leeds Times of 12 January, "was an appropriate termination to the solemn ceremonial, the trumpet solo being performed by Mr Bowling in the unavoidable absence of Mr Spark." 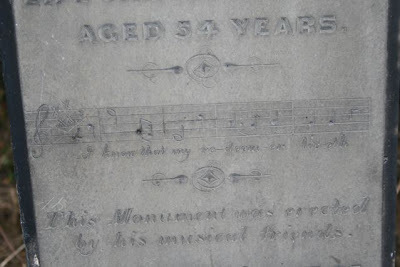 Joshua’s son Thomas was written down as a "warehouse boy" in the 1861 census, but music was in the family’s blood, and he was eventually to become the long-term organist at St Bartholomew’s in Armley, Leeds, famous in his time. His son, also a musician, was named Thomas Handel Cawthra. 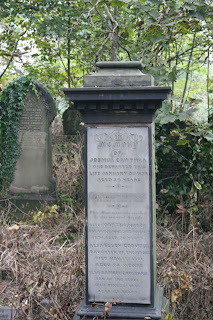 Shown here: Photos of Cawthra's monument in Burmantofts Cemetery, Leeds, by Richard Wilcocks. 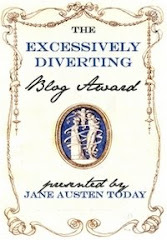 Great blog, glad to have found you! I too find old cemeterys fascinating.